I love this guy! He always seems to be our Monday King! 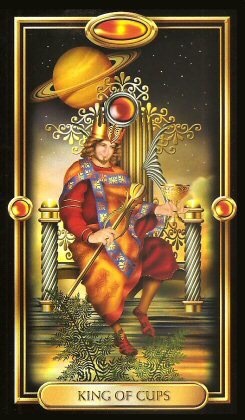 The King of Cups possesses many endearing qualities, among them, compassion, kindness, and generosity. He could be anyone, including you, even the Santa in front of the local grocer. When this King shows up on a Monday, I can’t help but think that things will run just a tad smoother. If there is any form of crisis which crops up, he is there to handle it. The King of Cups is representative of the “helpers”, as Mr. Rogers used to call them, the police, the firefighters, the paramedics, and anyone else who runs toward the danger, in order to help another living creature in need. This type of person has become a daily visual for all of us, with the news of so many catastrophic events throughout the world. Good still lives, and it does prevail.